During the Great Depression Franklin D. Roosevelt unleashed a massive programme to get the US economy back on track. His major aim was to create jobs. The series of programmes he initiated were described as the ‘New Deal’ and are credited with bringing back prosperity to the US and the world. President Donald Trump also has grand ambitions. He casts himself as the ‘Real Deal’ and this week he gave his second State of the Union address to Congress. The address, meant to give an update on progress and to outline political priorities, allowed Trump to make several sweeping statements about his successes. The media loves Trump because he offers them so many opportunities to pour scorn, to make fun of and to offer moral judgements upon. It’s not our job to jump on political bandwagons. Therefore, we have looked at 3 specific statements made during his address to see how his claims stack up versus reality. 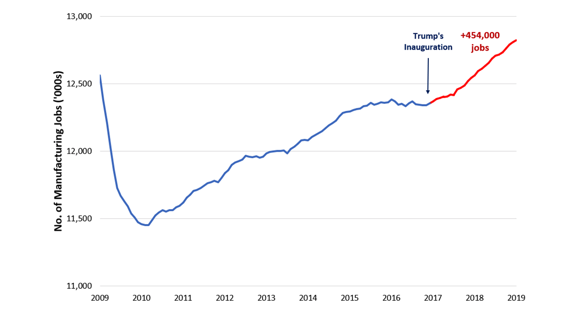 In the chart below we can see wages growing since Trump entered office in 2017. Presently they are growing at 3.4% year over year. This is 1% faster than two years ago. However, prior to the financial crisis in 2008 wages were growing at a faster clip, surpassing 4%. Hence, the statement he is making is slightly exaggerated. What Trump fails to mention is what really matters to people, wages keeping pace with inflation i.e. what we call real wage growth, after deducting inflation. In the early stages of taking office wage growth kept pace with inflation, leaving US workers not much better off, but through 2018 inflation began to ease back. This is better news for him and projections, represented by dotted lines in the same chart, indicate continued improvement in real wage growth. Trump has been vociferous in calling for lower oil prices. Lower fuel prices, act like a tax cut, increasing money in consumer’s pockets and leading the prices for goods and services cheaper. Whether low oil prices can be sustained is another matter but for now the trend is helpful with real wage growth expected to maintain positive. Not too far from the truth although the claim is exaggerated. The Bureau of Labour Statistics reports that in two years the economy has added 454,000 manufacturing jobs not 600,000 as stated. That said 4.9 million jobs in total have been created pushing the overall unemployment rate to the lowest level since 1969. It is also an impressive figure for manufacturing jobs considering it took President Barack Obama over 7 years to create 900,000 jobs in the same sector. The job surge is most likely the result of falling oil prices and an economy supercharged by the effects of fiscal stimulus i.e. corporate and personal tax cuts and the repatriation of overseas revenues from large international firms. It is fair to say that the improvement shown by the labour market is connected to Trump intervention and policy. Almost True. Economic growth at the time Trump took office was 1.8%, reasonable growth for sure. The latest reading of 3.4% is much better, but to exactly match his claim growth should be 3.6%. Therefore, shall we say, he has over reached slightly. Trump over excitedly described growth as “amazing” and “these numbers are very sustainable, this isn’t a one-time shot”. Economists on the other hand take a more cautious line expecting growth to moderate. The effect of the $1.5trn tax cuts in 2018 is expected to begin to diminish so the President will be looking at every angle to up the ante. One example is his recent spat with Jerome Powell, Chairman of the US Federal Reserve Bank, saying Powell’s decision to raise rates was crazy (he said “loco” which is Spanish for crazy). In the intervening period the Federal Reserve has become more dovish in relation to interest rate policy with the market now scaling back expectations for further interest rate rises. Trump entered office with very different policies compared to virtually any US President. A clear mandate in his own mind to “make America Great”. He has ditched the rule book causing great controversy internationally and with US voters. His ‘State of the Union’ appears to have done little to build bi-partisanship and there is little doubt Trump has his eye firmly on the 2020 Presidential campaign. He threw down the gauntlet with comments about socialists (a term of mistrust in the US), aimed directly at his rival Democrats with the aim of discrediting them in the eyes of voters. Whilst we cannot yet know the true effectiveness of his policies, economic results so far are impressive; just not as impressive as he would have everyone believe! Time will tell how his story will end. The title may seem strange as this article is about residential property, but the reason will become apparent. The value of residential property is close to our heart (and our wallet). One could argue we remain too obsessed about house prices, but whatever one’s viewpoint, it is helpful to try and get a broad perspective of the housing market. According to the Nationwide house price survey the average house price as at end 2018 was £214,178. If you think this seems a lot, pity the poor first-time buyer. According to Nationwide’s affordability index for first-time buyers, the ratio of average earnings to price is 5.1x i.e. if you are a first-time buyer with earnings of £20,000 the average says you can buy a property worth just over £100,000. Not a great outcome compared to the average price of a house in the UK. As with all statistics based around averages, the real story lies beneath the headlines. One of the major factors exerting an influence on affordability statistics in this country is prices in London. Would you be surprised if we told you that the affordability ratio in London is 9.2x average earnings? Perhaps, perhaps not. If you live in London we sense this will come as no surprise. Looking at historic trends helps. It gives a better a sense of what is changing and the direction of travel. The chart above tracks affordability for Londoners versus the rest of the UK. The average over time shows that property in London has always commanded a premium, averaging 1.5x compared to affordability elsewhere. However, we can see how it jumped to over 2x from late 2009. Recently, the trend has started to reverse and appears, emphatically so, to be heading down. The main point here though is that London prices have been distorted and continue to exert an influence on media commentary around prices. 2. Long periods exist when house prices have diverged both above and below the trend line in real terms. In simple terms there is something going on. • Availability of mortgages and the cost of borrowing both having gone through marked changes over the last 20 years. Certainly, taking the above into consideration, we have a complex pattern for examination later, but for now we attempt to put additional flesh on the bones of the real house prices chart. 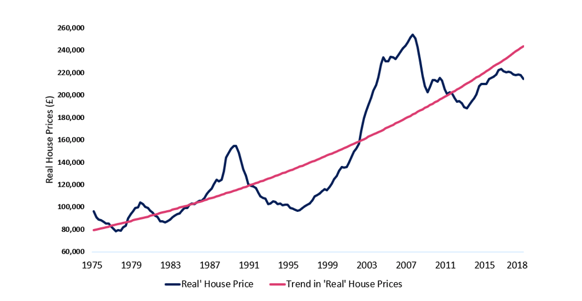 If you refer to the chart you will see that in the 6 years from 1989 to 1995, a period including a recession in the UK, house prices fell by 37% in real terms. This is worse than the drop from the peak in 2007, before the financial crash. After the crash in real terms prices fell by 26% before recovering again. We need to pay attention today to the fact that real houses remain substantially below their prior peak in 2007. When prices collapsed in 1989 it took almost twelve years to get back to their prior peak. We are now passing the eleventh year and house prices in the UK, on average, are 16% lower in real terms. Moreover, the slightly perplexing aspect is that the trend remains sloping downwards. There is little doubt that UK property goes through long cycles. The cycle since the financial crash is probably more painful than many people realise. It only becomes fully apparent when you switch to look at property prices in real terms, after taking account of inflation. In case you are wondering, the average price level peak, without adjusting for inflation back in 2007, was £184,131 i.e. prices today in absolute terms have grown but they are lower in real terms because they have not kept pace with inflation.